Pay up front for three or six months for a discounted rate. 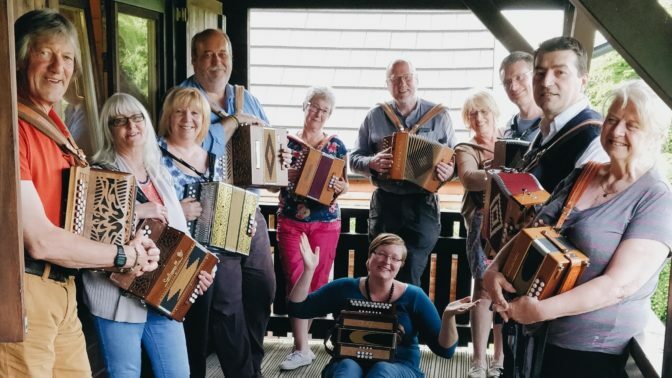 New to Halsway Manor – a regular monthly class run over six months for anyone interested in learning to play the Melodeon at beginner through to intermediate level. Tutor Mel Biggs will guide you in learning to master the basics and improve your skill and technique. Each class is 1.5 hours duration and will run monthly between January and June. 11 Jan 2019 | 8 Feb 2019 | 8 March 2019 | 12 April 2019 | 10 May 2019 | 7 June 2019. Everyone interested in learning to play melodeon and existing players of the D/G melodeon (diatonic button accordion). Sessions are organised by skill level. To find which skill level you are at please …..